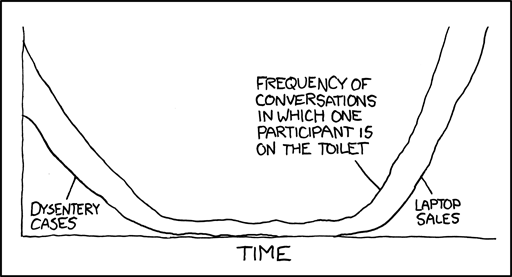 Forgive us for constantly posting xkcd stuff, but man, it's just freakin' brilliant. In further randomness, last night I heard a seriously inebriated reference to the classic Milwaukee punk band Die Kreuzen (click here for details). As the link shows, while the first element is quite often pronounced like English to die (rather than German [di:]) the preferred pronunciation of Kreuzen is German-like: with the diphthong of 'boy' and the produced as [ts]. The name is class punk: It's fake German — it's 'the crosses', except that the German plural would be Kreuze. I don't know if they got it from a dative plural form (which has an -n) or just took the wrong plural allomorph, but the plural is too big. The guy I couldn't help overhearing — let's call him Mr. Sloppy — was going on and on about various great shows of bygone days, including one by this band. Thing is, he called them Die Kreuzens. I know enough cases of double plural forms, but this is at least historically a triple. Whoa. Non-standard chilluns, as in "All God's chilluns got wings", is historically child+er+en+s. "Kreutzen" is, mutatis mutandis, the plural in Yiddish, though it's an infrequent word; the more common word for cross is borrowed from Hebrew, presumably to express contempt, but also as a euphemism. The -n plural here is not unexpected; it's a consequence of the apocope that all original Germanic words (as opposed to NHG borrowings) in Yiddish underwent. I wouldn't be surprised if some of the German dialects with apocope have the plural "Kreutzen." Someone once told me that nonstandard "Bedouins" is a triple plural, but I don't think that's true. Thanks. Yeah, tons of German dialects have a distinctly more Yiddish-like pattern here. Plurals have leveled in complex ways, and I think we get this kind of pattern (whether or not with this word) even in some non-apocopating dialects. Whatever the story on Bedouin (and I may have heard that somewhere too), John was right: There ARE some other triples out there.